Greetings & Salutations! December is here with rain, snow and icy temperatures! Alert: Inclement Weather Now! If you see anyone in need of emergency shelter, call 211. Keep flashlights and extra batteries handy!!! Check on your elderly neighbors! Please join us for some holiday cheer as we celebrate our neighborhood, neighbors and local businesses. Cocktails and appetizers. We hope you can join us. Thanks for being a great neighbor! When: Wednesday, December 21st, 2016 6:00-9:00 PM. Where: Opal 28, 510 NE 28th Ave, Portland, OR 97232. The next meeting is Wednesday, January 18, 2017!!! Meetings are scheduled for 6:00 pm and are held at: Pacific Crest Community School 116 NE 29th Ave. Portland, Oregon 97232 See you there next month!!! Be sure to enjoy the Winter events, festivals, concerts and all Portland has to offer! Next Meeting January 18th, 2017 at 6 p.m. KNA Holiday Party, Wednesday - December 21st, 2016 7-9 p.m. 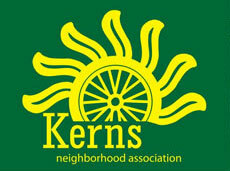 Enjoy winter in our Kerns neighborhood! Greet and meet your neighbors! Topics for next month may be added before January 6th. Please contact kernsna@gmail.com if you'd like to request time on the agenda. Applications Deadline Tuesday, January 10, 2017!!! Do you have a great idea for strengthening your neighborhood? Revive a forgotten city tradition? Host a civics workshop? Organize a tenant rights forum? Paint an intersection mural? Create a community garden? SE Uplift invites Portlanders like you to shape and create your neighborhood by applying for a Neighborhood Small Grant. The goals of the Neighborhood Small Grant Program are to increase the number and diversity of people who are involved and engaged in the broader community; strengthen community capacity to create change by building community leadership, identity, skills, relationships and partnerships; and increase community impact on public decisions and community life. Crash data helps PBOT decide where and how to invest in safety. But the time between when a crash happens and when the data reach PBOT's Vision Zero team for analysis can take months. Reducing that delay, and gathering better data on the role of speed, impairment and distraction in crashes, are key pieces of Portland's draft Vision Zero Action Plan. Most crash data is self-reported through the DMV. People in Oregon who are involved in a crash must submit a DMV form. If that crash (1) involves a motor vehicle, and (2) results in an injury or at least $1,500 in property damage. Portland Police gather data only on the most serious crashes-those that result in a crash victim traveling in an ambulance, or when emergency responders enter victims into the trauma system. Compared to self-reported crashes, police gather and report more detailed information on crashes, such as alcohol use. Council amendments were based on testimony they heard at their November 9 and 16 public hearings. Nearly 120 people testified in person, and Council received approximately 550 letters and emails during their review. What did City Council approve? Council voted on a set of concepts that aim to discourage home demolitions while increasing housing choice in single-dwelling residential neighborhoods. During the public hearings Mayor Hales often asked testifiers if given the choice would they recommend 1) do nothing 2) modify staff's recommendations or 3) start completely over. Most people responded that the recommendations were a good start but modifications were needed. Recognizing that the Concept Report gave general policy direction and guidance for staff to develop code and mapping proposals, Council made several modifications before they accepted the concept recommendations. SCALE OF HOUSES In an effort to reduce 1:1 demolition replacements (e.g. demolitions of a house that result in only one house being built), council voted to reduce the size of single-dwelling houses in the Housing Opportunity Overlay Zone (for example, from 2500 to 2000 square feet of living space on a 5000 square foot lot) while maintaining the same size limit for duplexes, duplexes and ADUs and triplexes on corners as what would be allowed for a single house outside the overlay (e.g. 2500 square feet on a 5000 square foot lot). HOUSING CHOICES Council did not revise the range of allowed housing types in the Housing Opportunity Overlay Zone (house with both internal and detached accessory unit (ADU), duplex, duplex with ADU, triplex on corner). However, they did direct staff to explore requirements and bonus unit allowances for age-friendly housing, affordability, and additional tree preservation. To encourage house conversion over demolition, the council voted to allow an additional unit when an existing house is converted into multiple units citywide (staff had recommended this bonus unit only in the Housing Opportunity Overlay Zone). Council also expressed the need to clearly distinguish an "internal conversion" from a near demolition and rebuild. NARROW LOTS Council rejected staff's recommendation to rezone historically narrow lots to R2.5, and instead voted for an amendment to not allow individual R5 zoned historically narrow lots to be built on - even when they have been vacant for more than 5 years, as presently allowed. Council also voted to remove staff's recommendation that front-loaded garages not be allowed on detached houses on narrow lots, as these will be less common as a result of the change to not allow houses on R5 historically narrow lots (narrow lots already zoned R2.5 zone will continue to be allowed). Next Steps The adoption of the Concept Report sets the stage for the next phase of the Residential Infill Project: code writing and map amendment proposals. Council's vote directs staff to develop the code language and map amendments needed to implement the concepts in the report. This phase, beginning early 2017, will include public review of a discussion draft, followed by public hearings at the Planning and Sustainability Commission and City Council before final adoption by City Council. Now when violations of Accessory Short Term Rental code are confirmed, property owners are given a 30-day compliance period to cease unpermitted activities or obtain permits for activity, where allowed. If uncorrected, fines of $707-$1,414 are assessed on a monthly basis depending on the length of the violation. Under the proposed Accessory Short Term Rental Enforcement Administrative Rule, property owners will not have a 30-day compliance period, and will be issued citations of $1,000-$5,000 per occurrence. Citations may be issued for each day of continued violation. Citations may be reviewed administratively, and then appealed to the Code Hearings Officer. The Code Hearings Officer may request additional documentation including, but not limited to, bank records, relevant tax records, and information from online platforms as a basis for their decision. Comments will be accepted in person at the hearing or in writing. Written comments will be accepted until 4:30 p.m. on Friday, December 16, 2016. Submit written comments to Mike Liefeld at BDS, michael.liefeld@portlandoregon.gov. Please take advantage of two opportunities in December to discuss Charter amendments to protect the Auditor's ability to hold City government accountable through independent audits and investigations. Your views will help shape the final proposal from the Auditor that City Council will be consider in January. Thursday, Dec. 15, 6-7:30 p.m. East Portland Community Center 740 SE 106th Ave.
Friday, Dec. 16, Brown Bag from 12-1 p.m. City Hall, Lovejoy Room 1221 SW 4th Ave.
Friends of Trees (FOT) Seeking volunteer Neighborhood Coordinators (NCs) to help plan and deliver the next community tree planting in the Kerns Neighborhood. NCs work as a part of a team with lots of Friends of Trees staff support. It's a fun and social role, with hints of customer service, advocacy, event planning, and community building. Volunteer hours range from 1-10 hours per month, but it's also a really flexible role that can be catered to your schedule. The Kerns neighborhood tree planting is on Saturday, February 4th, 2017. If you are interested in becoming the Kerns Neighborhood Coordinator, or simply want to learn more, please connect with Erica Timm at ericat@friendsoftrees.org or 503-467-2533. The Portland Police Bureau has three new recruiters, one sergeant and two officers, who will be actively traveling to colleges, job fairs, and other venues, and will continue to use social media to reach out to lateral hires and new officer candidates. "We have values in this city that are extremely important to us and we need officers who embrace those values," said Mayor Charlie Hales. "We need numbers, but we also need people who have those values." The Bureau currently has 74 vacancies, with hundreds projected to retire over the next five years. The proposal adds four categories of marijuana-related businesses to Chapter 14B.130: Marijuana Retail Courier, Micro-Producer Tier I, Micro-Producer Tier II, Micro-Wholesaler. There is also a proposal to lift the restriction on the delivery of recreational marijuana to consumers in the City; change the hours of operation of marijuana businesses to match those of the State; strike the requirement that video data from medical dispensaries and marijuana businesses be stored off-site; and introduce a series of technical changes that fix grammatical errors and clarify terms. * Arrange to pick up packages at the carrier or retail establishment. * Require a signature on deliveries. * Opt for deliveries to lockers or other secured locations where possible. * Ship your package to a location where someone you trust will be available to receive it. Although camera surveillance is beneficial to your home's overall security, it will not deter package thieves.